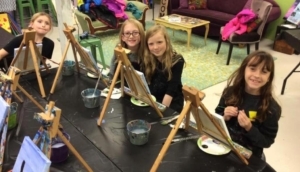 Join our amazing six week art classes for kids ages 6+. Built off of our fun summer camp events, your child will explore and learn new techniques for artistic expression. We will paint on canvas, explore many other ideas/mediums as well including watercolor, pastels, polymer clay and chalk. This is a great art sampler for your child(ren). When school is off in Bedford, we will not have class. Our studio is in the plaza with T Bones and is directly next to Frederick’s pastries. This five week ticket will cover all materials and classes from 3/14/18 - 4/11/18. Register one time and secure your seat for the duration of the after school art class workshops!